Will Its $13,999 Price Make You Long For This 1987 Mercedes Benz 300TD Longroof? The seller of today’s Nice Price or Crack Pipe 300TD is really eager to move the metal, so much so that he’s simultaneously posted the car on Craigslist and eBay. We’ll just have to see what the fuss is all about. In the movies, nothing good ever comes from camping in the woods. Whether it’s fighting off a deranged lunartic, alien abductors, or that grizzly that only concidered Dicaprio an hors d’oeuvre, camping can be full of peril. That’s why yesterday’s 1977 Chevy Blazer Chalet is such a perfect camper, as it needs a ton of work done before it’s ready to hit to great outdoors. That’ll likely postpone any egregious backwoods blundering. Perhaps forever because let’s be honest, you’d never finish the project anyway. That measure of safety did not perhaps factor into the camper’s laudable 65-percent Nice Price win, but its rarity and modest $2,995 asking price no doubt did. Look, I’m just going to come out and say it: diesel is the snake oil of our modern age. It is peddled by unscrupulous hucksters—typically with thick German accents, who promise that “it iz az clean az ze gasoline, und vith zoh much more torque” (flashes fist across chest in emphasis)—who draw us parlously into their web of deceit. You can still buy diesels here in the States, although not from what was once their most ardent supporter, Volkswagen. But the particulate pooping fuel’s days here, and elsewhere, might just be numbered. Or maybe not. The current sentiment in Washington DC seems to be “pollution is actually good! And making it from fossil fuels is even better, even though we believe fossils were put there by Satan to test our faith.” Yeah, these are truly crazy times in which we live. 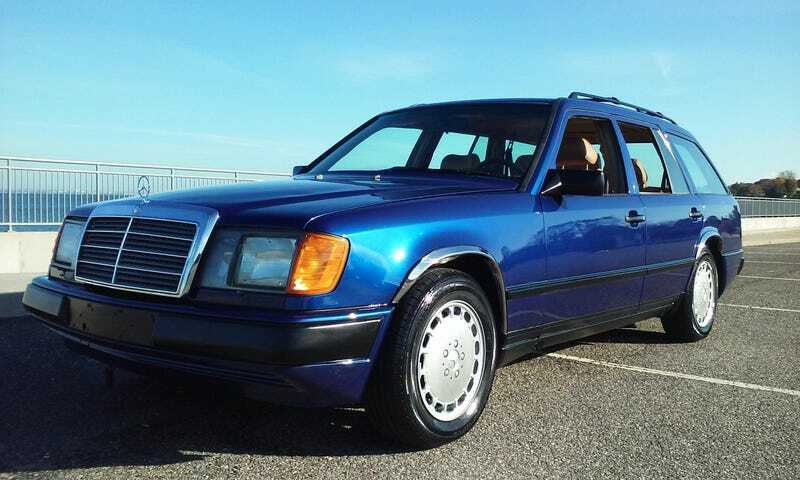 That’s why I’m ready to turn back the clock and have a look at this 1987 Mercedes Benz 300TD estate, which comes from an era when diesels weren’t bad (or at least we were blissfully ignorant of their true impact) and Mercedes models were still built like Panzer tanks. The W124 E Class was the last of that series about which claims of extraordinary durability and longevity could legitimately be made. That being said, I don’t think I’ve seen a W124 TD in this nice of shape in a long while. Maybe even a month. The car comes in Ultramarineblau over Palomino and with a mere 92,000 miles on the odo. The ad notes that the engine has seen “ALL NEW gaskets, in the entire engine,” resulting in “NO LEAKS or Burning of oil at all! !” It also comes with a new battery, fresh meats on its factory alloys, and some pretty sweet vacuum patterns on the carpet in back of the added-in third row seats. The ad is unfathomably difficult to read owing to its odd combination of capitalizations for emphasis and strange hyphenations of words (NATI-ONWIDE?). But don’t worry, I plowed through it and I think I got all the salient facts straight. Under the hood sits Mercedes’ OM603.963 SOHC straight six offering up 2,996 ccs of displacement. The turbocharged six was good from the factory for 148 horsepower and a substantial 267 lb ft of torque. That’s enough to reasonably let the remarkably light—3,330-pound—estate get out of its own way. Behind the oil burning mill is a four-speed automatic. Behind/above that is a cool single articulating windshield wiper whose incomprehensible function will immediately have you believeing in black magic. The ad claims that this 300TD feels like a 20K-mile car, driving soundly and with a perfectly working transmission. The drivetrain is original to the car, as is seemingly everything else short of the expected consumables and the stereo head unit. The interior looks awesome with what appears to be leather on the seats rather than MBTex, and lovely Zebrano wood trim on the dash. Door cards look clean and intact, while the rubber surrounds seem to be holding up admirably. The styling of the W124, both inside and out, is pretty timeless and while I don’t agree with the seller’s ad writing decisions, I do concur with his assertion that this Benz would make an enviable fashion statement. There’s no rust or apparently any other major aesthetic issue with the bodywork, although the seller does caution that it’s not “A SHOW CAR.” That’s okay, I’d just like to drive it. As I noted, the car has been up on both the Craigslist and eBay, and in that latter case, it clocked out without a sale. The seller does boast of “OVER 50 WATCHERS” there, but as you’ve no doubt discovered in certain sexual exploits, people who just like to watch aren’t in the business of getting the job done for anyone but themselves. No, it’s our job to let this seller know that, no matter where he hawks his amazingly clean Mercedes, he’s going to have to price it appropriately. Right now he’s got it listed at a cool $13,999. That hasn’t seemed to move the metal. Do you think that it just hasn’t met the right buyer? Or is that too many bucks for this classy old Benz. Denver, CO Craigslist, or go here if the ad disappears. H/T to Matt for the hookup! At $2,995, Is This 1977 Chevy Blazer Chalet A Camper That One Day Might Pamper?